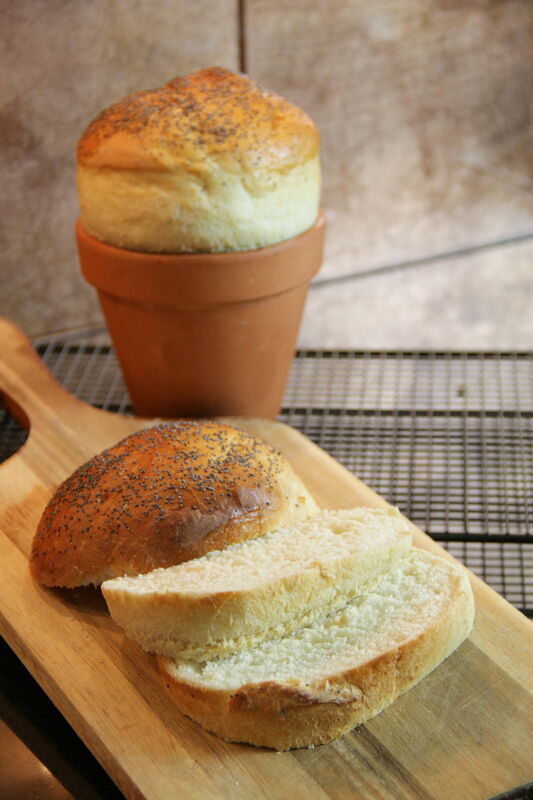 Some of you may recall Flowerpot Bread as a 70s fad, and right you would be. Baking with terra cotta, however, is an ancient process. The Greeks prized this method for its even heat and durability. Once you go through the fuss of seasoning your flowerpots, you can pull out this fun party trick anytime. 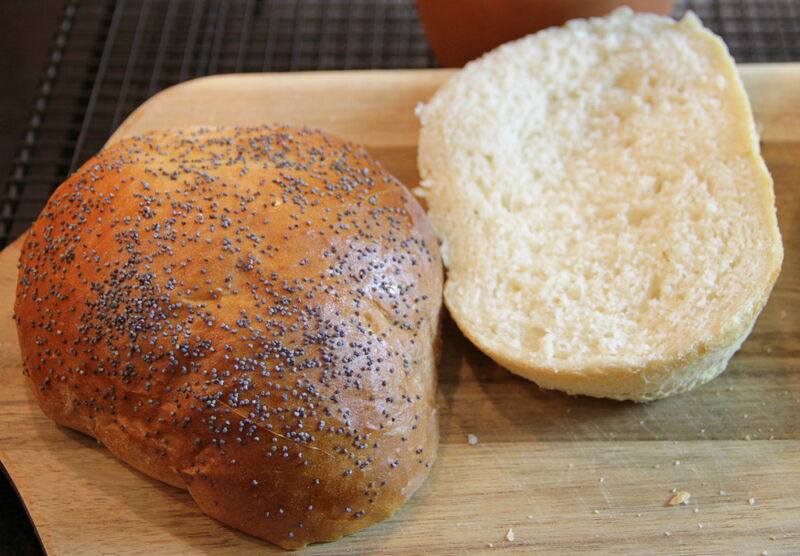 In this version, I’ve brushed the simple white bread loaves with a light egg wash and dotted them with poppy seeds. Any bread dough will work – just remember to fill up the pots only halfway at the first rise, and don’t let them get too tall at the second rise or they may topple over in the oven. The terra cotta holds a steady temperature, which helps keep even heat during baking, and also gives the rising a little boost. Try it out on a lazy weekend – for a breakfast in bed packed full of surprise and delight. A few days before baking bread, rub flowerpots all over with oil. Heat oven to 300°. 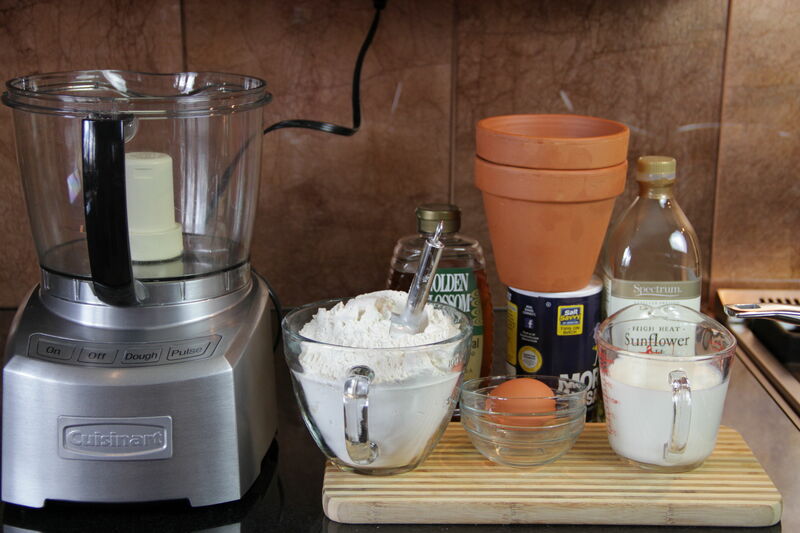 Place oiled flowerpots on a baking tray, and bake in the oven for a few hours to seal and season. Let cool before using. Repeat process after use as needed to retain smooth oiled surface. Add water to large food processor, or large bowl. Gently sprinkle yeast on top to cover surface. Set aside until yeast begins to activate, about 10 minutes. Pour milk into small heavy pot over medium heat. Cook without stirring until the milk is scalded (tiny ripples begin to form across the top of the milk), about 5 minutes. Let cool slightly, then add oil, honey, salt and egg yolk to scalded milk. Retain egg white. When tepid, pour milk mixture into food processor or bowl. Gently pulse on food processor dough setting or stir until mixed in. Add white flour, about a cup at a time, until mixed in. If using food processor, gently pulse until dough is compressed and begins to pull away from side of bowl. Be careful not to over mix or dough will become tough. If making bread by hand, turn out onto floured board and knead gently for about five minutes. Add about ½ teaspoon oil to large bowl. Place dough in bowl. Turn and flip so oiled side faces up. Cover with light tea towel and set in warm, non-drafty place to rise. Let dough rise for about one hour, until doubled in size. Punch down dough. Turn onto floured board and shape into 3 equal-sized balls. Oil flowerpots, and place one ball inside each pot. Dough should fill pot about halfway. Cover loaves with light tea towel and set in warm, non-drafty place to rise. 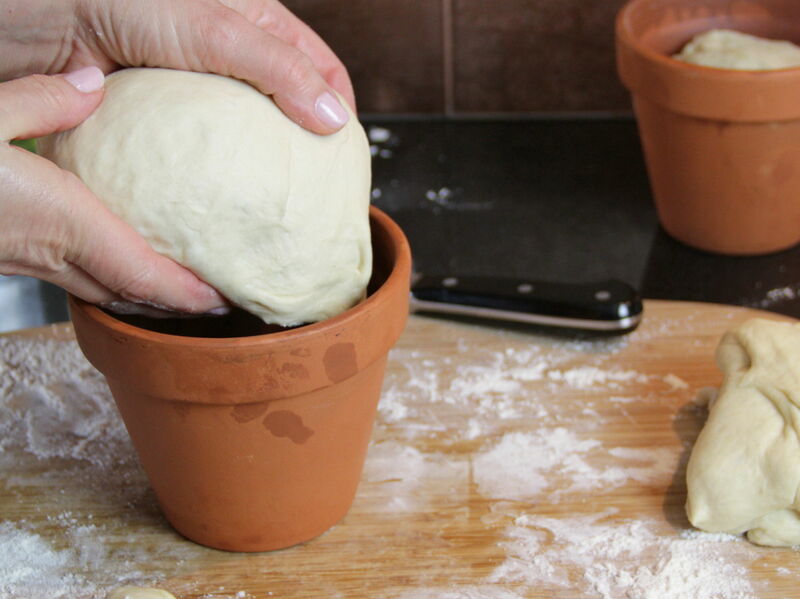 Let loaves rise for about one hour, until dough is one to two inches over the top of the flowerpot. Preheat oven to 350° about 15 minutes before dough is finished rising. Using a fork, beat egg white with about a teaspoon of water. Gently brush egg wash on top of loaves, then sprinkle each with a teaspoon of poppy seeds. Place loaves in oven and bake 25 to 30 minutes until browned. Cool for at least 1 hour before removing from pots and slicing. I came across this novel when I read a Buzzfeed list a friend had posted which recommended adult novels based on which young adult novels you liked. 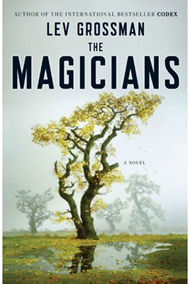 If you liked Harry Potter, then you might like The Magicians. One might also say that if you liked the Chronicles of Narnia then you might like this. Mind you, this is NOT a book for children. This story is about magic college, not middle school. It’s full of all the drinking, drama, and poor choices that twenty-something-year-olds, magically gifted or otherwise, would make. The story begins with a seventeen-year-old named Quentin who is bright and studious and who has never quite fit in. Secretly he still dreams of the magical world of Fillory, a series of children’s fantasy novels very much like Narnia. One day, after receiving a mysterious package, he finds himself transported to the campus of Brakebills, which is a school for magicians. He passes the entry exams and becomes a full-fledged student at a school of magic, draped in glamours that keep it hidden in the middle of upstate New York. Although there are little bits reminiscent of Harry Potter, this is not Harry Potter. Lev Grossman creates a unique magical world all its own. And although Fillory is like Narnia, you never see Edmund and Lucy behaving the way these magicians do. It’s a very intriguing and absorbing book even if, like me, you read so slowly it takes forever to get through. Well worth it in the end. I don’t often watch action movies. When dialogue comes second to the hand-to-hand combat and shooting, I’m generally not interested. But sometimes, it’s exactly what my brain needs. Especially a movie like Taken. One of those “you just messed with the wrong guy” movies. Bryan Mills (Liam Neeson) is a retired spy for the U.S. Government. Knowing all the bad things that happen, he is reluctant to let his somewhat estranged teenage daughter travel to Europe with no adult companion. Turns out his Spidey Sense was spot-on. Not an hour into her trip, his daughter and her friend are snatched while he is on the phone with her. 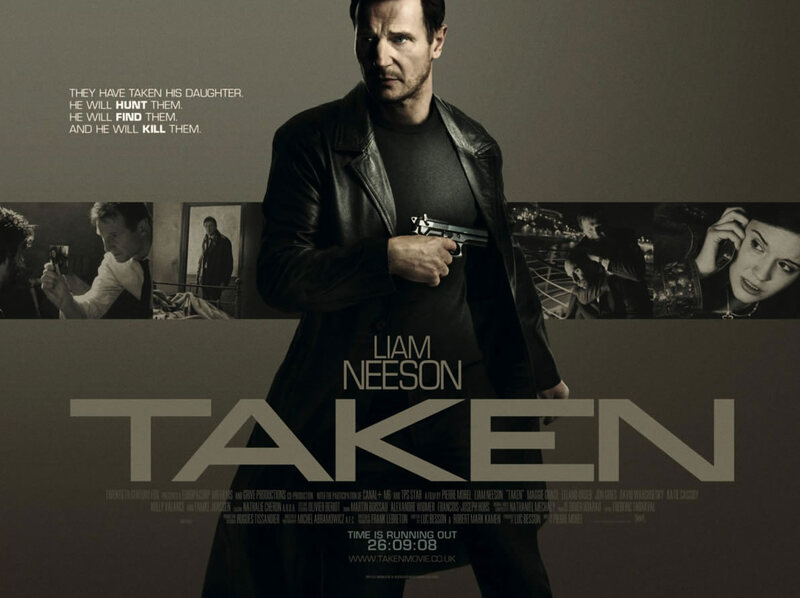 “Good luck” says the kidnapper when Liam Neeson warns him not to take his daughter or else. He should have heeded the warning! It’s a pretty formulaic movie. He was married to his work for too long. His daughter loves him but he doesn’t understand that she’s grown up. His ex-wife is fundamentally fed up with his ways. We all know that she’ll be changing her tune when his skills, which have removed him from his family, save his family in the end. I hear there is a Taken 2. Apparently his daughter is extremely takeable! Totally fun movie to watch on a rainy night. Because those bad guys just messed with the wrong guy. While it may not feel like it yet, spring is right around the corner. Technically, the first day of spring is marked by the vernal equinox, which falls on March 20 this year. One of my favorite things about spring, besides the fact that the cold weather and occasional ice storms will finally subside, is the opportunity to do some deep cleaning. As one of my friends back in college told me, “It’s not clean until it smells like chemicals.” While I don’t necessarily like the smell of ammonia and bleach, it is the best way to get rid of the musty smells that have accumulated over the winter. To me, the smell of cleaning products is the scent of accomplishment — something that can’t be achieved by lighting a candle. To get you prepared for spring cleaning this year, I’ve compiled a cleaning list to help make your bedroom sparkle anew. Remember, for efficiency sake, you want to work your way from the top down. Dust will tend to settle as you clean, and you want to get as much of it out as possible. 1. Vacuum the window treatments, and dust the blinds. Some people like to take the window treatments down and wash them, but this can be tricky depending on the fabric they’re made out of. 2. Clean your ceiling fans, light fixtures, and any pictures hanging on the walls. This almost goes without saying, but the tops of your ceiling fans get really gross. You don’t want to be breathing all that dust when it’s time to turn the fans back on. 3. Clean the air vents and as far inside the ducts as you can reach. You can soak your vent covers in hot water while you clean other things in your bedroom. After they dry, apply a thin layer of car wax and reinstall. Waxing your vent covers with car wax to keep dust off. This tip works for gas stovetops, and other places in the house where dust and grime tend to accumulate. 4. Clean all the windows inside and out. Don’t forget the windowsills. You’ll be surprised how much cleaner and brighter your room looks with both sides of the windows clean. If you have screens over your windows, you can wash these outside with a hose. Just be sure to let them dry completely before putting them back up. 5. 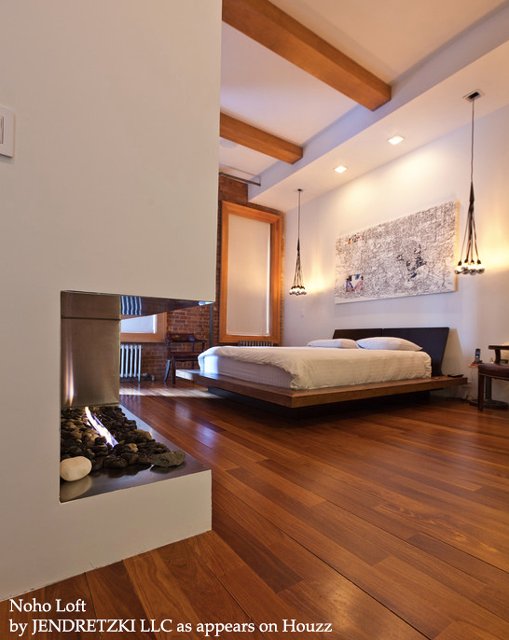 Take everything off the furniture tops in your bedroom and dust all the objects and surfaces. You may also want to take more drastic measures and remove all the furniture from your bedroom so you can clean behind and underneath. This may also be a good opportunity to rearrange your bedroom for a new look. 6. Wash all your bedding, including the bed skirt. For comforters, check the washing instructions. If it’s starting to get warm where you live, wrap up the comforter and store for the fall. 7. Vacuum the top of your mattress, and between the mattress and the box springs or bed frame. You can then freshen up your mattress with baking soda and lavender. Also, don’t forget to flip or turn the mattress, depending on the type you have. 8. Give the floors a good cleaning. If you have a rug in your bedroom, vacuum it first, then roll it up and vacuum the floor underneath. 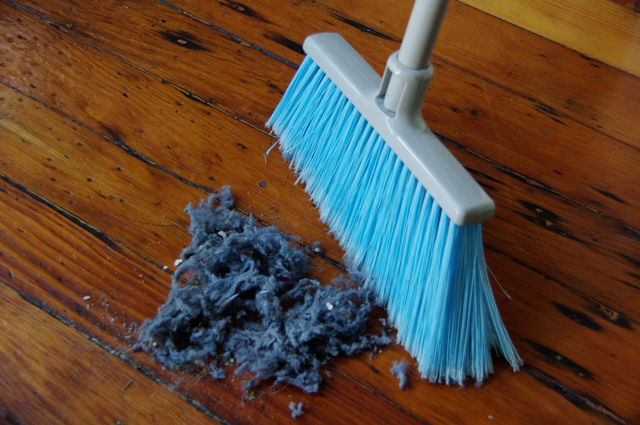 Dust finds its way everywhere in your home, including under the rug. If you leave the bed in place, don’t forget to vacuum under it. While you probably won’t find any monsters under there, you will find a lot of dust bunnies, which can be just as scary. 9. Put everything back in its place. 10. Pat yourself on the back for a job well done. This is also the perfect opportunity to take a nap. You deserve it! Rosie: Not much. Jeff let me in the kitchen this morning so I made breakfast for us. Me: Nice. What’d you make? Rosie: Well, I made a spinach omelet, but I made a big mistake. Me: What kind of mistake? Rosie: I added too much spinach for the amount of eggs. Me: So? What’s wrong with that? I like my omelets to have a lot of spinach in them. Rosie: Yeah, but this one had so much it should have been called Omelet Spinach. 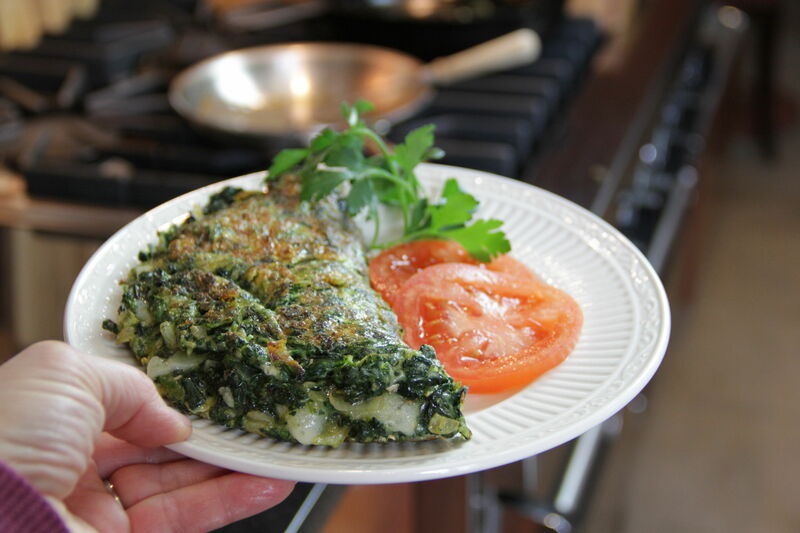 And, just like that, here it is – halfway between fluffy omelet and thick frittata, all the way from mistake to masterpiece – Rosie’s Omelet Spinach! Rosie confessed to adding some finely chopped, near-caramelized sweet onion at the start, then bringing it to a piquant finish with a bit of creamy, sheep’s milk manchego. 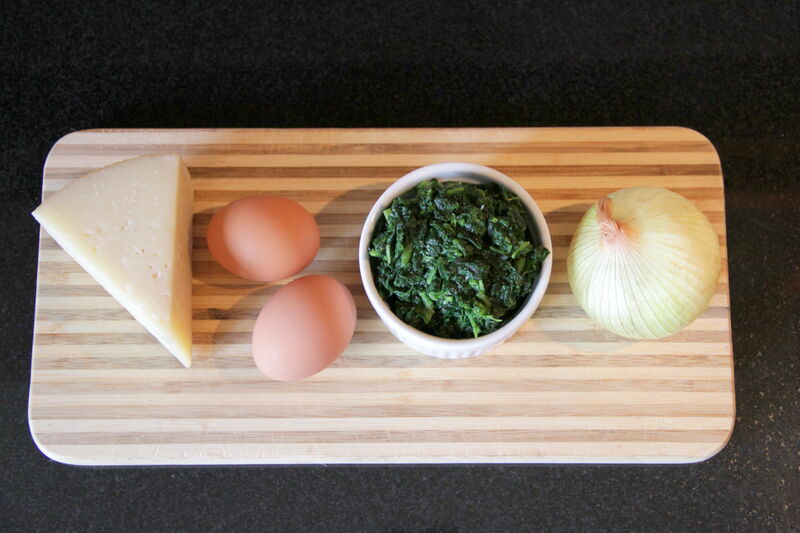 Be generous with the seasoning and make sure to drain the spinach well before cooking so the eggs are not soggy. Make no mistake – this recipe is a real keeper. So keep it around when you’re searching for a breakfast in bed that even Jeff would approve. 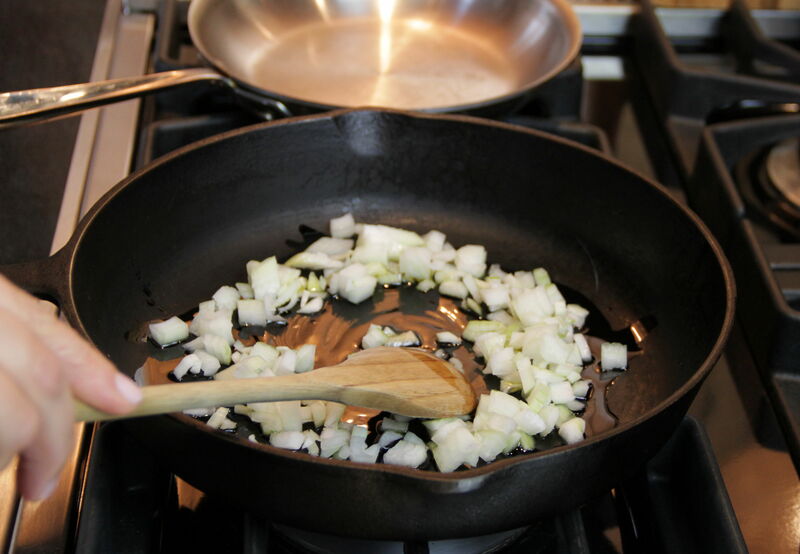 Pour olive oil in heavy frying pan and heat over medium heat. Add chopped onion and cook until softened, 2 to 3 minutes. Add chopped spinach and continue to sauté until all liquid has evaporated and spinach is beginning to lightly crisp, about 5 minutes. Remove from heat. Melt butter in a separate small, heavy pan over medium heat. Break eggs into small bowl, add milk or cream, and whisk until mixed. Stir in spinach onion mixture. 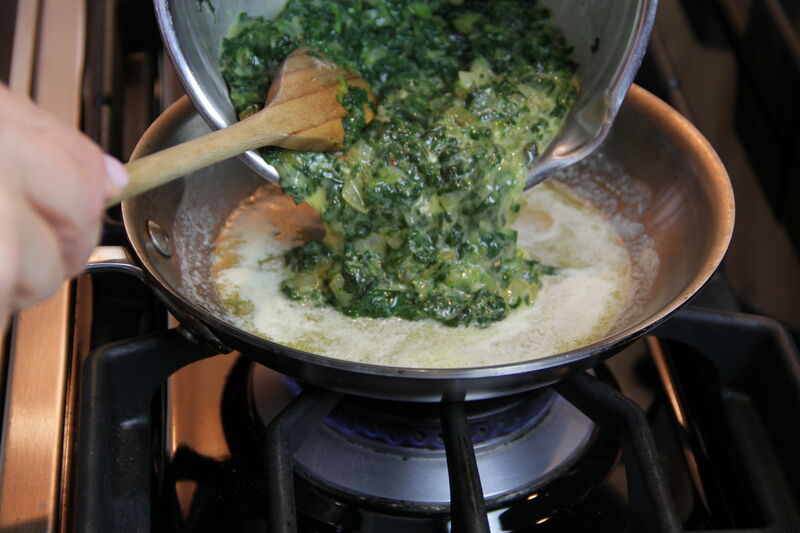 Add egg/spinach mixture to heated pan all at once and swirl to even. 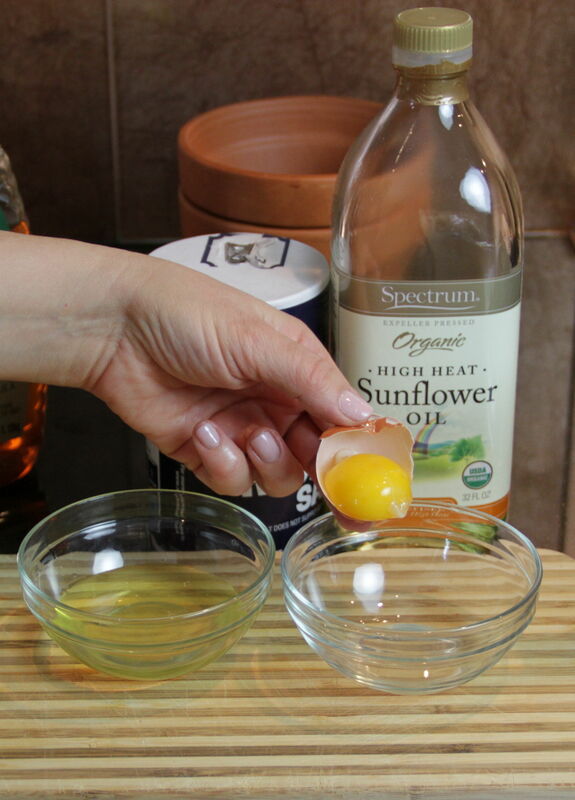 Tilt pan slightly, and lift edges lightly with a spatula, allowing uncooked portion of eggs to spread to edges. Continue to cook, reducing heat to low if cooking to quickly, until egg/spinach mixture is lightly puffed up and nearly cooked through, about 5 minutes. Sprinkle manchego cheese evenly on top. Use spatula to fold omelet in half, and continue to cook until eggs are firm and cheese is melted, another 1 to 2 minutes. Or, if you like, finish the omelet in the oven frittata style. 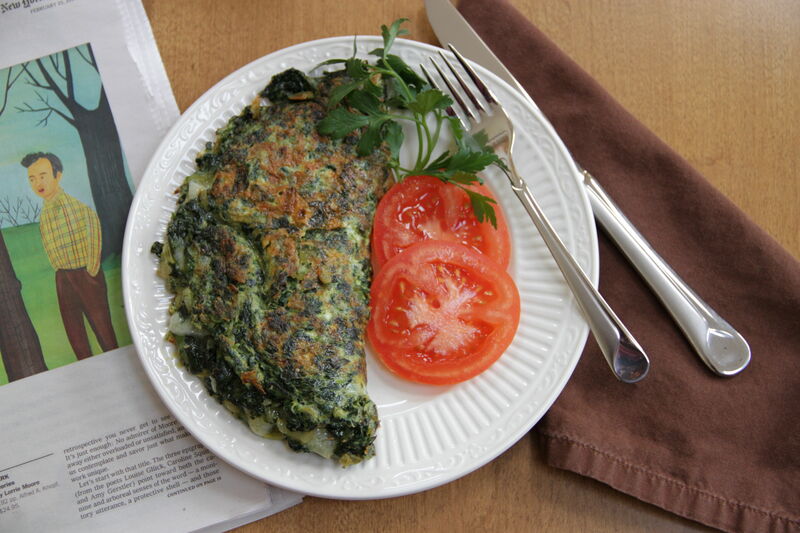 Turn the omelet out onto a plate, sprinkle with salt and pepper, and serve immediately.